Some of you might remember a certain little beast doing quite a job on my old niddy noddy. The poor thing was cut down savagely in the prime of its life. I probably could have sanded it down, refinished it and put it back to use, and, who knows, maybe I will someday, but it certainly hasn't happened yet and I don't see myself doing it anytime soon, so I've been using my leg as a niddy noddy since then, or just winding right off the bobbin, onto the ball winder. But between you, me and the lamppost, I'd been wanting a longer niddy noddy. 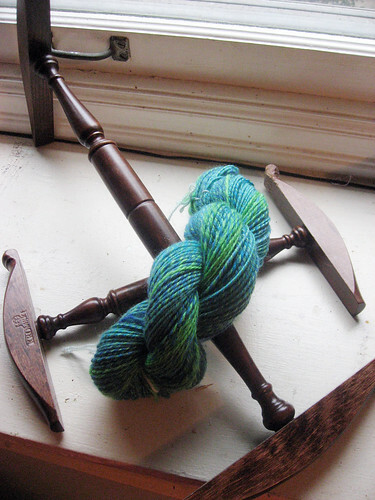 The short one is fine for what I can spin off a spindle, but off the wheel, I knew I wasn't getting an accurate yardage count because I'd have to wrap the yarn around the noddy so very many times, that it would bulge out substantially. Plus, these Kromski niddy noddies are really a pretty good price. And what's that pretty skein up there, you ask? The camera doesn't show the blues very accurately. The middle bobbin is like a dusty indigo color while the outer bobbins are a little less saturated but similar in hue to what you see. I got about 130 yards of all three colors combined and then another 20 or so yards of just the two outer bobbins combined and maybe 3-4 yards of just the green yarn. 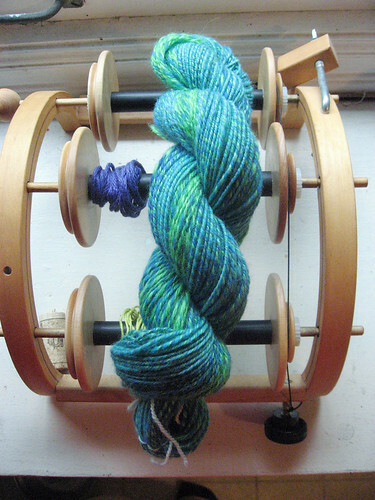 You can see the streak of very green color in the finished skein. Embiggening the photo should allow you to see the individual colors of the skein a little better. Somehow I missed the part of this showing the handspun and your tensioned lazy kate (I need one of those soooo badly). Awesome - love it! That yarn is really beautiful. I love those colors together! This is a tough one, you always have such nice pictures, but usually there's just one that really speaks to me. But this post, I just can't decide between the yarn and the puppy tummy. There's just something about a nice furry belly that just begs me to scritch it. Course, if I do that to my cat, I think he'd bite. Beautiful yarn!!! You're a fine spinner. I'm jealous! I'd love to learn. 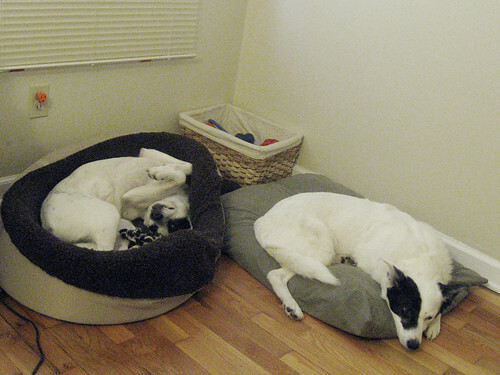 Or do I want another hobby..... How do you get your dogs to use their beds? OUr little guy does but the Aussie girl has a huge padded blanket thingy that we fold into her bed, sherpa side up, and she mucks around with it at great length with much snuffling and pawing, gets it just the way she wants it,and then lies down beside it! She's weird! Delurking to wish you and yours a Happy New Year. Long time reader! Oooh. Nice niddy noddy and beeeyooteeful yarn. Me likey. Embiggening made me laugh. I will have to use that. Pretty yarn! It brings to mind something tropical. You know--the ocean, palm trees, and a nice frou-frou drink with a little umbrella in it . . .
Do you know if the Kromski niddy-noddies help measure out yardage? I've been looking for a niddy-noddy but haven't decided which one to get. I'd like to get one that helps measure yardage since I don't have a yardage meter or even a wpi tool. Happy New Year to you, Leo and the pups! 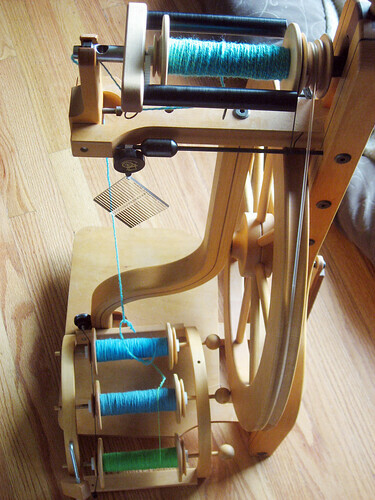 Wah... such a cool looking yarn machine! Wow,gorgeous colours,did you find the BFL fluffs up the corredale? I ve a little bit left that Im saving for a special project! THE snow pictures in previous posts are simply awesome,would love to see that sort snow fall one day!!!! your sleeping babies are adorable! is that a basket of knitting or spinning in the corner? That picture says it all: Life IS good!! This page contains a single entry from the blog posted on December 27, 2007 5:27 AM. The previous post in this blog was Bigger, longer and unchomped. The next post in this blog is Hello 2008.